Tomorrow night, scores of arts collectives and community groups will be putting on impressive exhibits, performances, and workshops as part of Scotiabank Nuit Blanche. The Toronto Public Space Committee thought it would be neat to do something, too, but guess which word in the event title made the TPSC uncomfortable. So instead they bring you noncorporatized Not Blanche, “a pwyc all-night public-space thing,” straight outta the Brunswick Theatre from 11:00 p.m. Saturday through 3:00 p.m. Sunday—sort of a Director’s Fortnight to Scotiabank Nuit Blanche’s Festival de Cannes. Come, go, stay a little while, or crash for an hour or two or more (there will be pillows! ), the Brunswick will be Public Space home base for the night. Activities include all-night films from Streets to Screens and the NFB, poster-harvesting and button-making, an Illegal Sign Safari (conducted by, who else, IllegalSigns.ca), a 1:00 a.m. bulb plant by the Guerilla Gardeners, a 2:00 a.m. Human River-themed Art Attack, and a 3:00 a.m. graffiti tour (with help from Style in Progress). Sunday morning will bring “Nuit Brunch,” ecology workshops, and a screening of the NFB water-doc Crapshoot. Crazy fun. 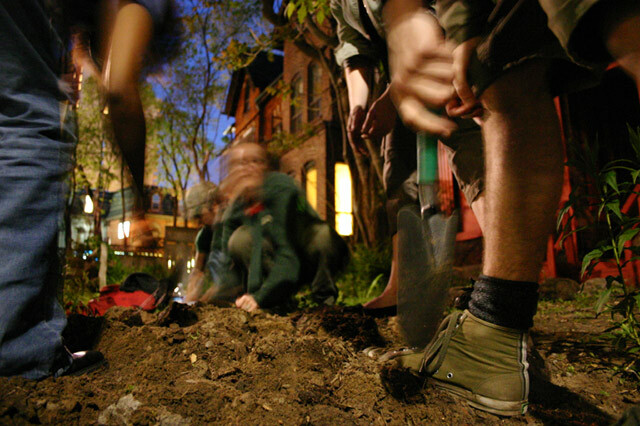 Photo of Guerilla Gardening’s 2006 “Pitch Black Night Attack” by the TPSC’s amanda! on Flickr. Jonathan Goldsbie, a TPSCer, wishes that Tree Tours had thought to call their event Blanche Du Bois. Filed under Brunswick Theatre, Jonathan Goldsbie, Pitch Black, The Toronto Public Space Committee, The Toronto, Toronto Public Space Committee, Toronto Public Space, are, art, Art Attack, brunch, environment, film, fun and games, graffiti, Night, nuit blanche, public space, style, Theatre, Toronto, Vandals!